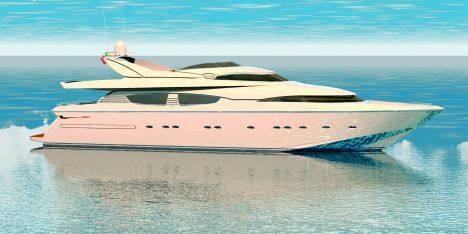 The Rizzardi boatyard expands its fleet of Motor-yachts with the addition of the new Technema 95, launched in April 2004. This is a project by the architect Carlo Galeazzi in collaboration with the yard's internal workshop. It presents harmonious, refined lines, as well as solutions resulting in comfortable, elegant and technologically avant-garde interiors. Attention has been paid to the smallest details in the interior furnishings with special exclusive solutions. Not only can all the fabrics and leathers be chosen by the owner, but personalisation even includes the choice of cherry, maple or satin effect oak to best meet the owners tastes. The owner will also have a say in the choice of bathroom taps and floors. These rooms deserve a special mention as the yard offers teak, marble and even mosaics for the floors and walls in the bathrooms. Hot/cold air conditioning and a plasma TV in all the cabins are a standard. A system in the saloon means that the TV can be hidden behind a large picture, which slides sideways at the push of a button thanks to an electromechanical system. The Technema 95 is designed over three and a half decks, with the main and lower decks dedicated respectively to indoor relaxation and the sleeping area. These two levels can be designed to one of three different layouts: one with four cabins and two with five. The first solution sees the lower deck divided into two sections, with the bow area dedicated to the crew and equipped with two cabins with a total of four beds and two private bathrooms. The remaining area is made up of a large owner's cabin in the far stern, furnished with a double bed, relaxation corner, vanity table and bathroom with its own Jacuzzi or hydro massage shower; two twin bed guest cabins using the same bathroom, a VIP suite with double bed, relaxation corner and private bathroom. There are two different solutions for the five-cabin layout; the first has the sleeping area only on the lower deck with the VIP suite used for the owner while two twin cabins have been put in place of the latter. The second version has the owner's cabin on the main deck and in the lower deck more importance is given to the crew's quarters. The standard design layout has the main deck divided into two sections, from the centreline to the bows there is the dining area, with a dinette enjoying a panoramic view in the far bows and the remaining area occupied by the pantry, galley and service bathroom. 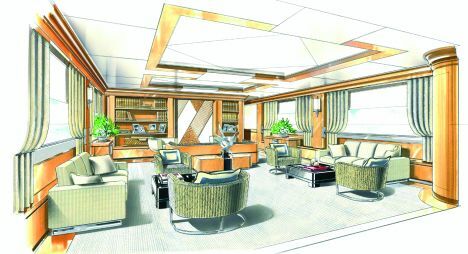 While the stern area is reserved for relaxation and offers a roomy saloon with two L-shaped sofas opposite each other to starboard, coffee tables and armchairs and on the opposite side a unit containing the multimedia system. There is also a small area furnished with a table and four chairs, to be used as an office or games corner. Outside on this deck we have a relaxation area in the cockpit, furnished with a C-shaped sofa placed athwartship with two cocktail tables. Halfway between the main deck and the flying bridge a half bridge has been created especially for the command bridge. Here we find a cockpit occupying the full beam of the upper works, an ergonomic armchair for the skipper and a small sofa. The flying bridge has roomy semi-circular sofas, a bar unit with sink, fridge and ice maker and the external command station equipped with all the steering and instrumentation controls. The stern area of this deck can house two jetskis or a tender and has its own davit for launching and heaving aboard. All the upper works are covered by a rollbar which also supports the aerials for the on- board electronics, in harmony with the yacht's design. Motorization is provided by two MTU 2,000 HP engines, which permit the Technema 95, according to information provided by the boatyard, to reach a maximum speed of 28 knots. For further information: Cantieri Navali Rizzardi; via Migliara 51 n.6; 04016 Borgo S. Donato; Sabaudia (LT); Italia; tel. +39 0773 531082; fax +39 0773 531093; website www.rizzardi.com; e mail info@rizzardi.com.